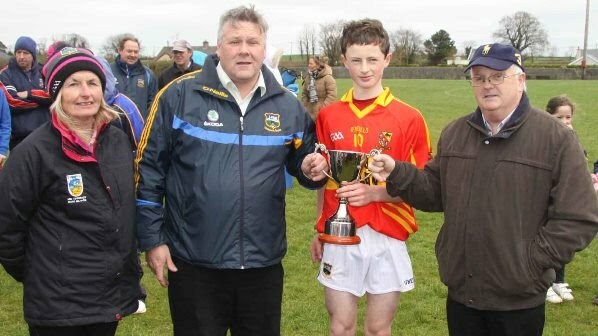 There is nothing like a great hurling match to warm the body on a cold sharp morning and all present in Littleton last Sunday morning can be thankful to both eventual winners Moycarkey-Borris and J.K. Brackens for a terrific match in the final of the Jimmy Coppinger Féile na nGael for 2014. Having both come through comfortably in earlier semi finals the scene was set for the staging of this well established and customary early season classic. With wind advantage Moycarkey set sail to attack from the throw in with Jack Fallon leading as captain of the ship. However, Nick Keane in the Brackens goal was well up for this contest and quelled three consecutive attacks before sustained pressure from James Dillon led to Fallon opening his account with a point from play fourteen yards out. Rory Darmody storming out of defence quickly followed his team mate shooting from distance. Andrew Ormond for Brackens was then hauled down going for goal at the opposite end and as Eanna McBride pointed the resulting free it would prove to be Brackens only score of the half. Elsewhere pre-start switches saw Egan marking Flood and he certainly had the measure of his opponent early on and with Shane Doyle working tirelessly in front of him they combined to try and keep Moycarkey at bay. Be that as it may the Moycarkey half back line was controlling the play with Max Hackett in particular in inspirational form as he cleared every ball which came his way and more importantly delivered that ball effectively into his forward line. Darmody too was playing his part with Fallon as they controlled the play. Moycarkey’s first goal came in the ninth minute when Darren Flood broke free of the shackles of Michael Egan to set up Eamonn Martin whose shot in deceived the keeper as it dipped under the bar to the net when it looked like a point was on. Further points followed for Moycarkey who with a minute to the break were awarded a penalty after Flood had his jersey well and truly pulled as he bore down on goal. Fallon rifled over to leave it 1-06 to 01 at the break. Immediately upon the restart Brackens started asking questions of the Moycarkey defence as they strove to get back into it. Two placed balls, a sixty five from Doyle and a free from McBride had them back in contention. Flood though was now roving and when he slipped inside the defence his ground pull from close in saw the green flag raised for a second time for his side as they again stole a march. Fallon then popped up with a sublime point from the right touchline to increase the advantage. Brackens didn’t submit and using their physical strength they powered their way back into it led by Doyle, Egan, McBride and Ormond, scoring 1-03 without reply inside six minutes, the goal coming from Ben Collins in what could be best described as an exact replica of Moycarkey’s first goal and Doyle also scoring one of the points of the day. With four between them the game was in the melting pot before a brace from Fallon eased the ‘Borris nerves. As both sides justifiably began to tire, Moycarkey outpointed Brackens three to two in the remaining minutes to seal a deserved victory and complete a memorable week for the club as they secured the Jimmy Coppinger Féile and Peil double. Full credit to both sets of players firstly who gave their all in a terrific contest and especially too for referee Martin Ryan who let the game flow and allowed the players the freedom of the pitch to showcase their skills much to the enjoyment of everyone. Mid Coiste na nÓg Chairman Joe O’Sullivan and Jimmy Coppinger sponsor with Secretary Sally Young then presented the cup to a jubilant Moycarkey-Borris captain Jack Fallon. Moycarkey’s schedule is only getting busier but they will take it in their stride as they now look forward to semi-final action against North opponents in a few weeks time and look to build on their momentum. Subs; Ciarán Kirwan, Diarmuid Maher, Bill Hackett, Michael Maher, Aidan Scott, Brendan Looby, Daniel Brown, Michael O’Donnell, Liam McDonagh, Shane Bourke, Pat Hackett, Ben O’Dwyer. J.K. Brackens; Nick Keane, Martin Bergin, Ben Collins 1-00, Patrick Martin, Conor Cadell, Shane Doyle 03 (01’65, 01f), Marco Quinlan, Michael Egan, Andrew Ormond (C) 01, Lorcan Roche, Eanna McBride 04 (03f), Ciarán Byrne, David Moran, Noel Morrissey, Darragh Doyle, Subs used; Diarmuid Delaney, Ewan Scott, Stephen Delahunty, also Aaron Quinlan, Troy Costello, Jack Prout, Conor Keating.